On the spotlight in this week’s History of Magic is Orson Welles, whom movie fans will know for his ground-breaking films like Citizen Kane, The Lady from Shanghai, and The Third Man. Even today, cinema students study his innovative film techniques, while historians remember him for the night he terrorised a nation with his radio play, “The War of the Worlds.” Orson Welles was a writer, director, actor, broadcaster and all-around genius. He was also a magician. He loved to perform magic and at this he was superb. In 1925 when he was only 25, Hollywood beckoned to Welles. He created what many still believe is one of the greatest films of all time, Citizen Kane. Welles continued to work at his magic and some felt that his films were an extension of his magic. When World War II broke out, he decided to put on a major show for servicemen and women. In 1943 in a huge tent in Hollywood, he produced the “Mercury Wonder Show.” Service men and women got in free while the public had to pay. 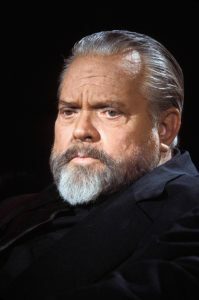 A number of motion picture celebrities presented circus-type acts while Orson Welles did magic. He performed the dangerous Bullet Catching trick, Harry Houdini’s Needle trick, and the Borrowed Bill in an Orange, along with lesser known but dazzling effects. During one of his World War II magic shows featuring his wife Rita Hayworth as his illusion assistant, a newspaper reviewer wrote that Hayworth was sweating profusely as she emerged from a cabinet illusion. Welles took offense and wrote a letter to the editor in response, stating that Miss Hayworth does not sweat….. She glows! In the same year, Universal Studios did a film called Follow the Boys. 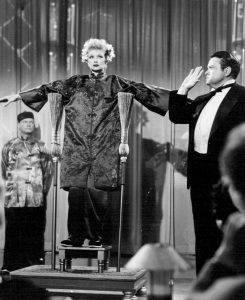 In this film, numerous stars did vaudeville acts while Welles sawed actress Marlene Dietrich in half. In the 1950’s, Welles did a three-week stint at the Riviera Casino in Las Vegas with his own magic act for which he received the fee of $45,000. Part of his show also included recitations from Shakespearean plays that had growing appeal in America. 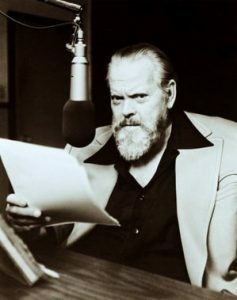 Welles always had trouble raising money to produce his own films and spent much of his time acting in films of others where he often played the part of magicians. In Henry Jagloms’s film A Safe Place (1971), he played the part of a magician who befriends a young girl. In the film Get to Know Your Rabbit, he taught actor Tommy Smothers to become a tap-dancing magician. In 1973, he directed and acted in the film called F for Fake (which never actually finished) in which he performs a number of magic tricks including an Asrah levitation. Earlier in 1949, in his film Black Magic, Welles played the part of Count Allesandro Cagliostro, who was a 16th century occultist and adventurer of dubious fame. On October 30th 1938, as part of the radio broadcast drama War of the Worlds (which was based upon the HG Welles book), Orson broke into the programme at various intervals to deliver a series of simulated news bulletins with the news of an alien invasion by Martians. In many parts of America, people panicked as the resonant, deep voice of Welles was quite realistic and convincing. The whole thing was a hoax but it certainly established Welles’s fame as a dramatist. As a result of this event, the Federal Communication Commission established strict rules on radio where there was a possibility of a broadcast inducing mass panic. For many years, Welles worked on a film project called The Orson Welles Magic Show but the plot of the film kept changing. A significant part of the movie was meant to showcase Welles’s magic capabilities. It was to be filmed using only one camera angle and no editing cuts. He wanted to prove that his magic was not accomplished by camera trickery or special editing. However, the project was never completed for release. Orson Welles continued to perform magic right until his death. He had a number of television special performances and I have a recollection of him performing at the Magic Castle. He was interviewed on numerous American talk shows and he was a frequent guest on the Merv Griffin Show. 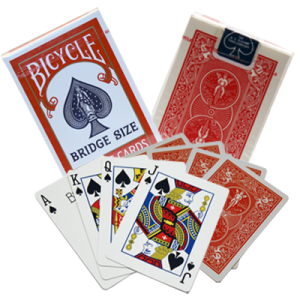 He often performed magic on these occasions and the night before he died, he actually performed a card trick on Griffin’s show. He died on October 10th 1985 at age 70. There is no doubt that the genius of Orson Welles was better known in the motion picture industry than in the history of magic. Be that as it may, his magic was memorable and it was something he was involved in all his life.